The building included a machine laboratory, called the high bay area. One of the architects told Ryder and Boast, “If you are going to have a room that big, it had better be so high.” The new building reflected the continuation of electric power teaching, but had flexibility for other academic pursuits, including electric circuits. Most of the building was completed in 1950. Due to budget constraints, only the power lab and first and second floors were completed at that time. The third floor and auditorium were completed in 1951 and 1952, respectively. In the 1990s, the department began upgrading its facilities. 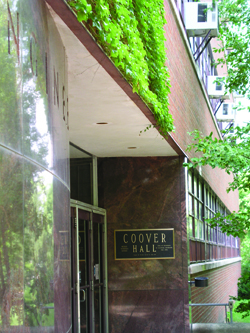 In 1999, the department unveiled the Active Learning Complex (ALC), a learning space especially for students, located in the former high bay area of Coover Hall. The ALC space was intended to enhance learning through the facilitation of communication and interaction among students. In 2006, the department began construction of a $16.5 million addition on the west side of the building. To make room for the addition, the department tore down part of the old Coover Hall. The addition opened in 2008 and added 23,000 square feet for classrooms, research labs, and teaching labs. The department currently is raising funds to begin a second phase of building and renovations to upgrade its facilities.